Welcome to the Whitworth, Admission Free! 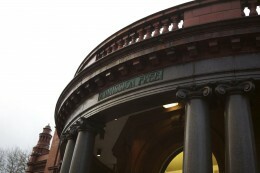 The Gallery is situated in Whitworth Park, opposite Manchester Royal Infirmary. It is about 1.5 miles south of Manchester city centre, to the south of The University of Manchester campus. Admission is free! We have an excellent café and gift shop on site. We are open on Bank Holiday Mondays *. The Gallery will be closed on Wednesday 7 September 2011 for an whole-staff training day. The Gallery will be closed from Saturday 24th December and will reopen on Monday 2nd January 2012. As per gallery opening hours. We aim to be accessible to visitors with disabilities. Wheelchairs, rollators, seating, free portable stools are available on request. There is a toilet for disabled visitors. Low lighting in most galleries. The lecture theatre is fitted with an induction loop. Large print information is available. Guide Dogs are welcome. If you require assistance during your visit, please email whitworth@manchester.ac.uk telephone 0161 275 7450 or ask at the Welcome Desk.